New Pixalate data has revealed that the Connected TV/OTT marketplace is in a phase of rapid growth in the United States. But which devices are behind this growth? For this study, Pixalate measured Connected TV/OTT programmatic ad impressions throughout the U.S. in 2017. 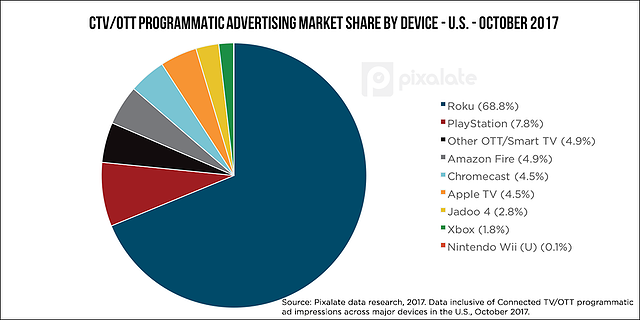 According to Pixalate's data, Roku dominated the Connected TV/OTT programmatic ad space in 2017. By October 2017, Roku had nearly doubled its market share, up to 68.8%. Saw its share of the Connected TV/OTT programmatic ad marketplace rise every month from January to October 2017, according to Pixalate's data. Rose from 36.2% to 68.8% in this time span. Started 2017 with the second-largest market share, at 14.5%, according to Pixalate's data. Amazon Fire saw its market share bounce between 4% and 8% throughout 2017, per Pixalate's data. According to Pixalate's data, Chromecast was steady in the 6-8% range from January-July 2017. However, from August-October, Chromecast was in the 3-5% market share range. Apple TV is the only device that did not seen a sizable difference between its market share to begin the year (4.5%) and its market share as of October 2017 (4.5%), according to Pixalate's data. 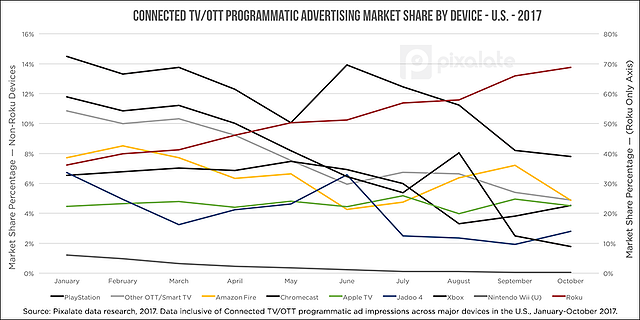 Apple TV’s market share was in the 4-5.5% range for every month studied. Jadoo 4’s market share decreased from 6.7% to begin the year to 2.8% as of October 2017, according to Pixalate's data. This device’s market share was above 3% every month from January-June, but it was below 3% every month from July-October. Xbox’s market share decrease began in May before reaching its lowest point (1.8%) in October 2017. Nintendo’s Wii (U) accounted for about 1% of the marketplace to begin the year, but that number dropped to about 0.5% by the spring, according to Pixalate's data. The Wii’s market share was 0.1% each month over the final four months studied. 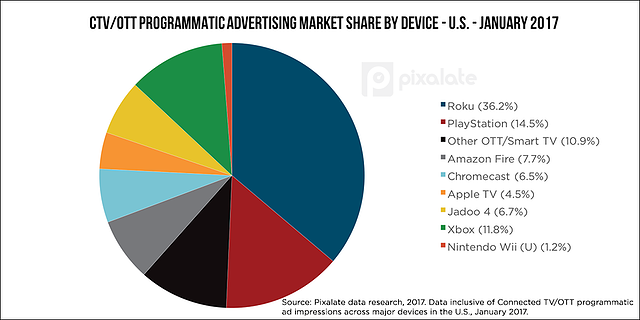 According to Pixalate's data, Other OTT devices, and Smart TVs, accounted for about one-in-10 programmatic ad impressions in this space to begin the year. This number dipped to just below 5% as of October 2017.